This is the story of four women dealing with all the obstacles life throws in their paths from divorce to children to death to families. When the women become friends, they decide to meet twice a month on a Sunday and share their innermost secrets and problems as well as a few glasses of wine and some good food. Jamie is the editor-in-chief of a wine magazine. When tragedy strikes, she’s left with a very small income, a daughter to raise and a senile mother-in-law. Kat and her second husband Christian are busy juggling their restaurant and a very dysfunctional family. Their children from previous marriages are more than a handful and Kat is afraid they will end up destroying her marriage. Danielle is a vintner whose husband walked out on her to begin a life with a new family. She’s left to raise her two teenage daughters, but she’s thrown for a loop when her daughter, Shannon, returns from college with news that rocks Danielle’s world. Alyssa is an artist and gallery owner who is desperately running from her past. Just as she’s about to get married, her past is thrown in her face and turns her world upside down. These four women are friends dealing with real life problems. Sometimes they confide in each other and other times they try to handle things on their own. In either case, they have more than they can handle. This is the first book I’ve read by Michele Scott. She also writes the “Wine Lover’s Mystery Series” which I have in my TBR. If this book is any indication of her writing, I know I’m going to love her cozy mystery series. Her words flow beautifully on each page and her characters are very realistic. These women are believable and readers will truly care what happens to them. By the time the book was finished, I was sad to leave my newfound friends. I really do hope there is a sequel to this book. I want to find out what happens next in these women’s lives. This book was truly special so I’m giving it my Socrates’ Great Book Alert medal. And this is the first book that I'm using my new ratings system and it gets 5 kitty cats! THIS WEEKS LETTER IS: "H"
Only total desperation could reunite Dianna Kelley with Sam MacKenzie, the irresistible bad boy she walked out on ten years ago. But the fearless firefighter with the awesome wilderness skills is the only one who can take her where she needs to go. It's a gamble - tracking down her endangered sister while keeping Sam and their undeniable attraction at arm's length. Not easy when they're trekking into a remote corner of the Rockies, where she's got to trust her former lover with her life. Despite their past, Sam never could refuse a damsel in distress, especially one who has haunted his dreams for years. He'll help find her sister and get Dianna out of his system once and for all. But soon it's hard to tell whether the greatest threat is from the rushing rapids, the deadly enemy on their trail, or the passion that's sending them straight into the line of fire..
“Anasazi Intrigue” (ISBN-13: 978-1-58982-587-1, American Book Publishing, 2010) can be purchased through local and online bookstores. For more information, visit www.lindaweaverclarke.com. Publicity contact: www.american-book.com. 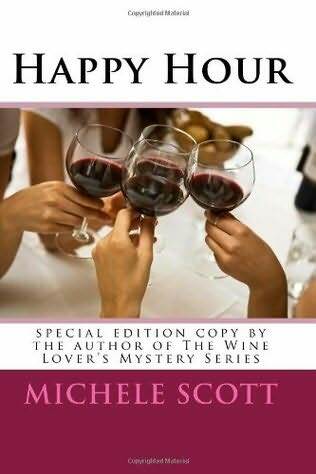 This week I'm reading a review book "Happy Hour" by Michele Scott. Life is like a roller coaster. There are ups and downs and twists and turns. Things come at us from every corner, every direction. Just when you begin to think that life is predictable, you can be thrown a curve ball and things get crazy. I'm really enjoying this book so far. No, I can't concentrate on anything else while I'm reading. I even find it hard to read while there's music on. I need complete silence in order to concentrate. Although I can multitask, just not when it comes to reading. I can blog or play computer games while I'm watching TV, but not when I'm reading. It was a slow week for me, but they are two books I've had on my wishlist for a long time. Thanks to Paperback Swap, I finally got them. It's been a fairly good week for me...I finished one audio book "Worst Case" by one of my favorite authors, James Patterson. I loved it and already posted my review. I, also, finished Executive Lunch by Maria E. Schneider, an author I just "discovered". I have a couple more of her books to read and review as well. I enjoy her writing. Very good - would definitely recommend. Eh....not the worst book in the world. Don't even bother with it. Well, that's my week in a nutshell. I hope you all had a great week! 1) How did you begin writing? I've been writing ever since I can remember. Probably my earliest work was a play or two in high school when we were asked to re-enact a historical event. I've always been a daydreamer, so technically, you could say I write in my head just about any time I'm sitting quietly! 2) Where do you get the ideas for your stories? Ideas are the easy part for me. They show up like dust bunnies, even when I'm not looking for them! Getting them down on paper in a readable form--that is the hard part. Like dust bunnies, they tend to fall apart, scatter and otherwise evade the broom. 3) Do you do any research for your books? What kind? I research all my books. 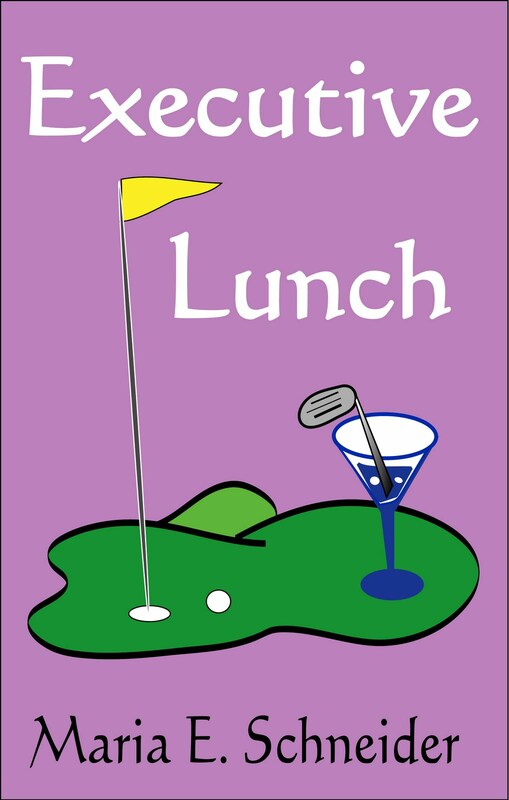 Even though I was in the computer industry for several years, when I used computer references as I did in "Executive Lunch" I often consulted with experts. 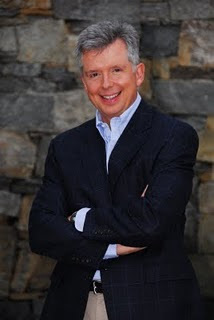 In this case, my local expert is down the hall--my husband! If he doesn't know, he'll know someone who knows the answer to my questions. When I wrote "Catch an Honest Thief" a lot of my research came from internet articles. Alexia, the heroine in "Thief," uses a lot of new-fangled gadgets to get herself out of trouble. I used a lot of inventions that are in prototype stages or devices that have been invented, but never really caught on, usually due to the high expense of implementation. I love inventions--the possibility of an answer that is better than anything we've seen before intrigues me. 4) Who is your greatest influence? Probably my parents. I get stubbornness from my father and faith from my mother. Their ability to withstand the hard, knock-down winds of life has always influenced me--to never give up, to keep standing and to find worm holes to get where I want. From a writing perspective, a friend pointed out that I was probably influenced by Elizabeth Peters. I hadn't noticed this (but would be more than proud to claim such!) It turns out that my character, Demetria, in "Sage: Tales from a Magical Kingdom" does enjoy some of the qualities found in Amelia Peabody, one of Peters' main characters. They are both matronly, wise and witty--or so I tell myself! 5) How did it feel when you first found out you’d be published? The first short story I published was with www.towndrunkmag.com. It was a pretty happy moment, fraught with nerves! But it was a huge milestone for me, a line that I had wanted and needed to cross for quite some time. 6) What genres do you read for your own enjoyment? I read a lot of mysteries, fantasies, and urban fantasies. I also read some thrillers, sci/fi and some non-fiction. When I travel, I read guidebooks like crazy. 7) Can you tell us what you are currently working on? Oooh, you want secrets!!! :>) I have a few projects that get moved around on the burners. My next book will most likely be a collection of short stories based on the Max Killian character (that first short story I ever published!) It will be out for ebook readers (Kindle/Nook/Sony and so on) in May. "Tracking Magic" includes five stories about Max and his investigations. Yes! "Executive Retention" should be out July 2010! It's in various stages of editing/copy editing now. 9) Of the books you’ve written, do you have a favorite? That is such a difficult question. The Sedona books are a series I have worked on for several years. With all the work and rewriting that went into the series--I obviously loved the books or I would have abandoned them years ago. I have an urban fantasy that will likely be out late this year or early next. "Under Witch Moon" has elements of mystery and magic--two things that I really love in books. I guess the answer is...I have favorites. It's usually NOT the book I am working on at a given moment because that book is being worked on to fix some imperfection! 10) Do you have any advice to those aspiring authors out there? Read--a lot. Read things you don't like--and ask yourself why you don't like them. Read things you do like--and understand why you like them! Don't give up writing after one book or one story. Writing is something you get better at over time. Read your old stuff. Improve on it. My best advice is: Do other things besides write. My ideas come when I'm hiking, when I'm working, or when I'm gardening or cooking. They come from interacting with people--they come from some of those hard knocks that life throws at you. Have an income other than writing (actually no matter what career you are in, always be honing other skills. They will come in handy!) As grandma used to say--Don't put all your eggs in one basket. Once again, thank you for visiting with us, Maria, and for giving me the opportunity to review your book. Sedona O’Hala lives a quiet, unassuming life as a lab assistant at Strandfrost. Then, one day she arrives at work to find herself in the middle of an assault on her co-workers. Sedona takes matters into her own hands and manages to fight off the assailants and save the day. She learns there is a plot going on behind the scenes to rip off company funds and the bigwigs of Strandfrost wan Sedona’s help. The company sets Sedona up in an expensive condo along with an expensive car, as well as a “promotion”. It’s not too difficult an assignment and she finds herself almost enjoying it, until she realizes no one at her company can be trusted. Things may be more dangerous than she thought possible. Ms. Schneider creates a world of kooky characters involved in a sinister plot. Each character has a well developed personality of their own – some you’ll hate, but others you will fall in love with. Humor and mystery are mixed together to form this fun and fast-paced read. It had the feel of one of Janet Evanovich’s Stephanie Plum books. I hear a sequel is on the way and I, for one, am looking forward to it. Wealthy college students are being kidnapped, tortured and left for dead in New York City. Detective Michael Bennett is called in to lead the investigation with the assistance of FBI Agent Emily Parker. Together, they try to figure out who is behind this diabolical plot and how to stop them before more innocent kids are killed. Meanwhile, the kidnapper is having fun leading Mike and Emily on a wild good chase around the city. He has no intentions of stopping until his mission is complete. Toss in a little romance between Emily and Mike and this story has everything a suspense lover like me can want. The story takes numerous twists and turns along the way. It all leads to one explosive ending that will leave reading shaking their heads in shock. I’m a huge James Patterson fan and he never disappoints me. This book is no exception. I listened to the audio version and it kept me at the edge of my car seat through the entire book. Talk about captivating, this book is that and more. I couldn’t stop listening to this one. I wanted it to keep going and never end. There are two books before this one which features Michael Bennett. I have the first, but haven’t read it yet. It doesn’t seem to matter though. I was still able to enjoy this riveting book without reading the first two in the series. 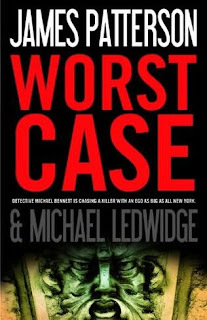 I love the character of Michael Bennett and this has the potential of being a long term series of books ala Alex Cross. No, not really. The only time that happens to me is if I'm reading one thing and then a review book (with a deadline) comes in. Then, I might stop what I'm reading to do the review book, but it depends where I'm up to in my current read. Usually, I'll just wait until I'm done with the current read. Although, if the current read isn't holding my interest all that well, and I hear about something good, I might take a break to pick the recommended book up. The norm for me, though, is to finish whatever I'm reading before starting something else. I was on my way to the lab when Sally Bunker, our adorable very scatterbrained secretary screamed. If I hadn't had an armful of papers I might have covered my ears. Sally was frequently what one might refer to as unprofessional, but she was so well liked that no on every actually mentioned it. More worrisome, the next sound from down the hallway was remarkably whimper-like. This is an ebook that you can get from Smashwords. I'm almost finished with this and I'll post a review later in the week. This is a good mystery. Where do you keep the books on the top of the tbr pile? Not the bunk of the mountain, but just the tip of the peak – the ‘almost up to’ books? I keep a huge bag behind the door of my guest room with my TBN (to be read NOW) books. The bag keeps growing and it's extremely hard to open the door to the room. LOL Problem is - the books to be read NOW, never seem to get read NOW. I end up changing my immediate reads around so much either due to my mood swings or a review request. Those things tend to put my immediate reads to the side. There really is no rhyme or reason to my TBR, but I do try - it just doesn't always work out for me. We are having such beautiful weather in New York. The temperatures have been in the 70's and the sun has been shining. It's absolutely perfect. They say it won't be lasting, but I'll take what we can get after the horrible winter we had. I only completed one book this week...Double Play by Jill Shalvis and I enjoyed it. 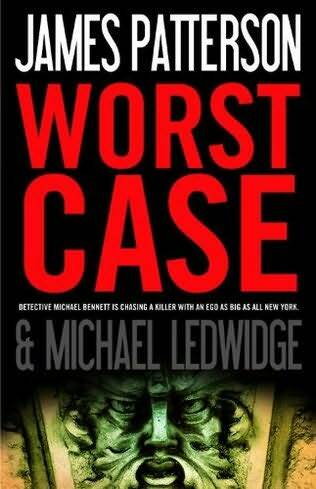 I'm totally loving James Patterson's Worst Case. I'm listening to this on audio and it's everything I love about a Patterson book. I've decided to use a ratings system when I write reviews. For a long time I was resistant to do that, but I decided to go ahead and start. I'll be posting my ratings scale soon and, yes, I'll be using cat heads!!! LOL Do you use review ratings? Are your pictures (whether they are stars, hearts, etc. )just pictures you add to your blog or is there another way to post the rating images? 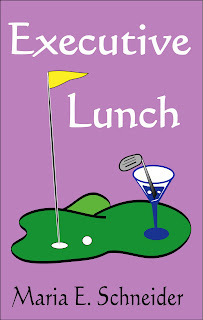 Right now I'm reading a mystery called Executive Lunch by Maria Schneider. It's for a review and Maria has graciously agreed to do an interview for my blog. That will be coming up with my review of her book. She has two others I'll be reviewing as well. I'm excited about that. All winners have been notified by email. I need snail mail addresses no later than Monday or other winners will be drawn. On a side note: I'm listening to this right now and absolutely loving it! The star baseball pitcher for the Pacific Heat is facing the possible end of his career. Pace Martin is desperately hoping his injury isn’t permanent. Pace and the team are trying to keep the degree of seriousness out of the press. When the team’s public relations department insists he do an interview with Holly Hutchins, he’s less than pleased with her questions. That doesn’t stop him from being very attracted to the beautiful reporter. Holly Hutchins suspects all is not as it seems with the Pacific Heat. She’s assigned to do a series of articles about the team and she plans to do the job right. She might find herself falling wildly in love with Pace, but she’s determined not to hold back the truths she uncovers. Even if that means hurting the one man she never wants to hurt. Amidst injuries, drugs and betrayal, Pace and Holly somehow grow closer despite their attempts to fight their attraction. As a baseball fan, I love to read a baseball romance before the season officially starts. This was a good choice for me since its been a long time since I read a Jill Shalvis book and I always love her writing. This is no exception. I love the characters in this book. They are colorful characters readers will find themselves caring about. Even the secondary ones come to life. There’s a second book called Slow Heat which was released about a month ago and, of course, it’s already in my TBR. In Eternal, Tex., Ruby Rothman, a 46-year-old rabbi's widow, calls upon her knowledge of the Jewish community and her skills as a savvy computer consultant in this entertaining debut. When the sister of the temple board's vice-chairman is fatally felled by a poisoned bagel, the police arrest the baker, Ruby's friend Milt. While filling in for him at the bakery and trying to figure out why anyone would want to kill the mousy woman, Ruby finds a note in her late husband's files warning him to stay away from Milt and his bakery. After she is almost hit by a car on her way home one night, she decides that her husband, who died in a hit-and-run, was murdered and that she's the next target. But why? She learns about two brothers who started in the cutthroat bagel business in New York in the 1930s and pieces together the family feud that brought Milt to Texas. Memories of older relatives and additional notes from her late husband's files suggest that his family may have been involved in the feud, and then the threats on her life get more serious. 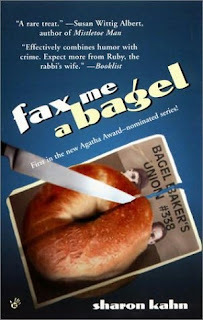 Although the direction of the plot is given away in the first chapter, the action unfolds at a smart pace as readers are given the inside scoop on rabbi selection and installation and the history of the bagel union in New York. With her low-key sense of humor and her perky inquisitiveness, Ruby is a welcome addition to the ranks of amateur female sleuths. Teenager Frank Locke’s life is not an easy. Living in North Carolina during the early 20th century, he is faced with hardships, poverty and violence. He deals with an abusive father and tries to protect his mother as best he can. When tragedy strikes his family, Frank leaves his home and the woman he has fallen in love with, Mary Lizbeth. Frank overcomes many obstacles as he flees his home town, including falling into a whitewater river. He is pulled ashore by the beautiful Sophia. Frank finds himself falling in love with her, but still in love with the woman he left behind. Suddenly, he’s part of a triangle he never saw coming. This is quite an emotional story. The words flow brilliantly through each page and each character is crafted expertly. The Southern voices ring true and clearly throughout this book making the reader feel as if they are part of the story. 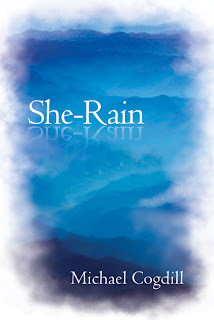 For more information, visit http://she-rain.blogspot.com. On the morning of May 29, 2008, I lifted Savannah from her bed, carried her to the car, and made the longest seven-mile drive of my life. At the office of a veterinarian, welcomed by that profession's unique form of love, I soon lay on a cushioned floor beside a golden retriever who showed virtually none of her age, watching both my hands stroke the face that had welcomed me home for thirteen years. The answer to a yearning awaited us that morning. It was part of the quiet covenant I made with Savannah the day my wife, Jill, and I adopted her. When a sweet dog's bloodline comes in confluence with our own, we human animals take on a sacred devotion. As sickness comes on hard and takes down the joy of living, caring dog owners are committed to shouldering our beloved family member to a merciful death. On the floor that morning, I answered Savannah's courageous outreach for that death, allowing her to carry me. The peace that arrived in her final breath lifted the tide of my heartbreak. As I nearly drowned in sadness, Savannah showed me to the shore of a graceful goodbye. Later that day, a prominent friend in Hollywood, fresh from the same grief in his own family, shared with us some comfort, but also a spiritual yearning of his own: Why would God measure the lifetime of dogs, and other animals we love, by a virtual hourglass when we live by a calendar? Why so little time on earth for those so good and loyal? It seems a cruelty. After these months of healing, and the reporting of countless human tragedies on television, I've arrived at a conclusion: Savannah's too-short life, like that of all sweet dogs, calls us to a fine urgency dogs get after big living. They seem illiterate of worry, yet able to read joys that elude us. They quietly shout to us: Wag your backside to music instead of your tongue to malice. Wallow less in pity and more on the bed of the one you adore. Give yourself, extravagantly, away. Savannah feared nothing about death. She went to it with eyes full of gratitude for the way her life had been. Her eyes seemed to draw from some deep well of love, way beyond the crust of words. Even in her final hour, sick as she was, she lived as a divining rod to this love. No matter how I tried to comfort her, sheserved me -- right to her last moment. The kidney failure that was stalling her life was no match for the servant's heart within her. The high pitch of biased media, politics, and the vitriol of social debate held no allure for Savannah. She made grace her way of life. She ran from loud voices and bounded to gentility wherever she found it. We could trust her to be tender, even with the smallest child. Savannah taught me there's nothing so powerful in this life as a truly gentle woman or man. There is no vanity in such dogs. They split mud holes, then track adoration across the floors of the humans who forgive them. They surely wonder why we care so much for things and so little for helping one another have simple wellness and fun. Savannah never cared for the size of my car. She simply loved the ride. She measured none of my money in how she valued me. In times of my sorrow, she made certain to place her head under my hand, letting me read a sense of all-will-be-more-than-well in its Braille. With the too-often forgotten elderly in a nursing home, Savannah visited with no consciousness of herself. The sights and smells that repulse too many humans never seem to repel a good dog. Something innate about Savannah longed to care for everyone. She never appraised anyone by their politics, religion, or race. No human bloodline or job pedigree held any sway. Savannah treated the ignorant as kings and the malicious as queens. Even avowed dog haters valued what they found in her, and she loved them without pause. Such a dog will forgive to the point of endangering itself. Some may argue enough hatefulness will turn any dog, even the most generous and kind. Perhaps this forms a caveat to us as well. Maybe good dogs teach us we will eventually draw back what we put into the world. Or is it that forgiveness becomes a form of capital we spend to the great shock of our enemies, an investment from which we draw the interest of turning enemies into friends? After every trip to the vet, on the heels of cavity exams every sane creature loathes, Savannah forgave Jill and me. We never had to ask. In the afterglow of thinking of her, I adore considering how living so might change humankind. What might the news look like if everyone were so devotedly kind to everyone else? My job -- as a writer of news and fiction -- would so beautifully change. Within an hour after putting her into that permanent sleep, I sat weeping at our kitchen table and wrote an open letter to Savannah. It let my grief out to run, with the memory of her a comfort at my knee. I leave you with a passage of it here, and a wish that the news of our future days will improve, changed in some small way by the legacy of Savannah. "You tracked to the child who lives in me always. In this man you found a boy who loves you, sweet girl. Even in death, somehow you will always lead the boy in me home. I will follow your trail. And together, in the grand wet and muddy fun places of memory, we will be glad." I'm now a proud owner of a Barnes and Noble Nook ebook reader and I'm loving it! I already have some books that I put on it. I'm anxious to start reading on it, but first I have to finish the book I'm reading now. The book I'm reading now is Double Play by Jill Shalvis. It's a romance taking place in the baseball world. I wanted to get in the mood for my favorite sport which will be starting soon. I only finished one book this week. Trust Me by Brenda Novak and loved it. Romantic suspense seems to be my favorite genre lately. On a personal note, we had a huge rain and wind storm yesterday and a huge tree was uprooted and fell on my roof! Naturally I was home alone and my husband was working, so naturally I panicked. My husband came home and it was too late (and too wet and windy) to get the tree off the roof until today. We have a huge leak in our living room windows. So now we have to get the roof and the leak fixed. What a pain, but these things rarely happen to us. We're usually luckier than this.